Another lovely valley above Cauterets, this time to its south. Above the powerful cascades at its foot emerges a valley of visual magic, with lakes and meadows at its floor, forest and on the slopes and harshness in many varieties above. This is a bit of a there-and-back valley walk, up to the Lac d'Estom and then onto the Lac Glacé, one of a number of of lakes and ponds hidden in a particularly rugged cirque gouged into the high ridge near Vignemale. Consider spending the night at the (smallish) Refuge d'Estom. There are a couple of day walks on the valley sides. 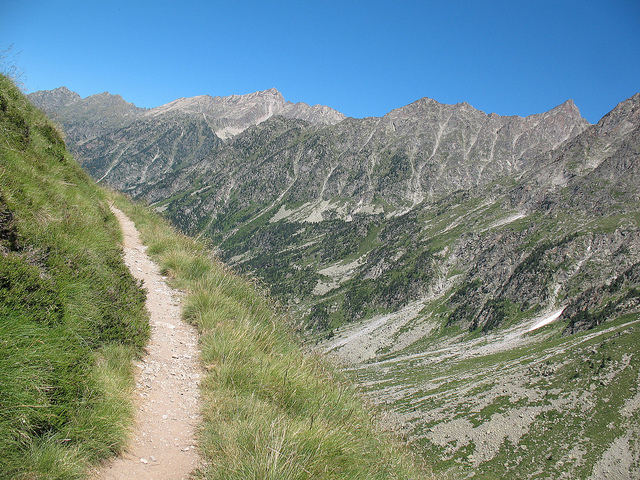 Consider crossing the Col d'Availle into the gorgeous Vallée de Gaube to the west, whence back to Cauterets in 2 days. This can be tough walking in high mountains with very changeable weather. Come prepared!